I’m still receiving my CSA boxes but I’ve been spreading them out since I can grow a lot of my own produce right now. 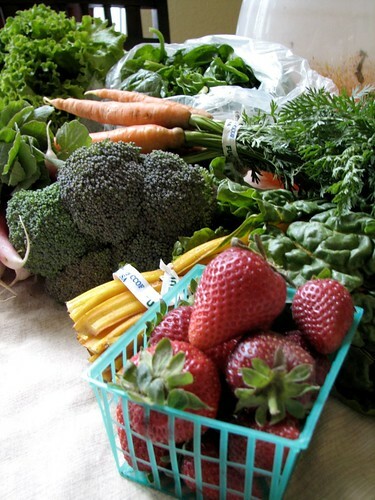 However, it’s still a treat to get farm fresh asparagus and strawberries. 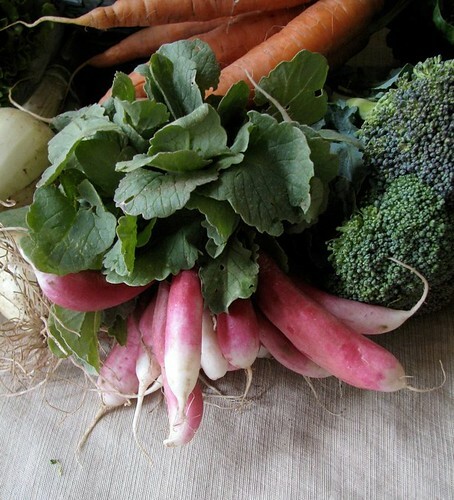 April’s CSA box was filled with greens. I blame the cooler the temps for the lack of the variety. 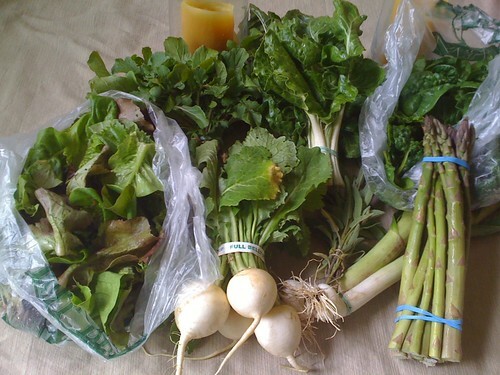 The box contained a bag of lettuce, bag of spinach, a bundle of Swiss Chard, green onions, argula, asparagus and Tokyo turnips (which I actually ate and enjoyed). Since I already grow lettuce and spinach I pushed back my next CSA box to May. My May CSA box was a big improvement. I received the sweetest strawberries that I have ever tasted. 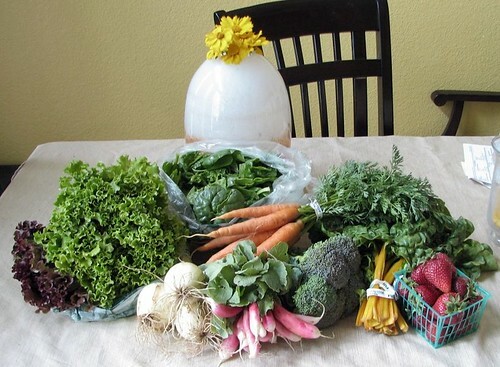 The box also contained two big heads of lettuce, bag of spinach, breakfast radishes, bundle of carrots, big green onions, broccoli, and a big bundle of swiss chard. 101 cookbooks: Has a great recipe that involves roasted broccoli and cauliflower. I substitute sun dried tomatoes for the raisins and almonds instead of pine nuts. Simple Recipes spin on Tomas Keller’s Roast chicken. It’s a little more work but everything about this dish is amazing. It incorporates turnips, potatoes, and carrots along with the chicken. Giada De Laurentiis’s recipe for Champagne Risotto was the first risotto I ever made. It involves asparagus, champagne, and prosciutto. When asparagus is in season I find myself making this on a biweekly basis. Yummy!!! I wish my own garden was putting out that much produce right now! Carrie- me too! especially if I had asparagus and strawberries. I’ll leave out the Swiss chard and turnips. Your vegies look so good. I will have to look for the Tokyo turnips…they look good! Happy summer eating…and have a nice holiday weekend!